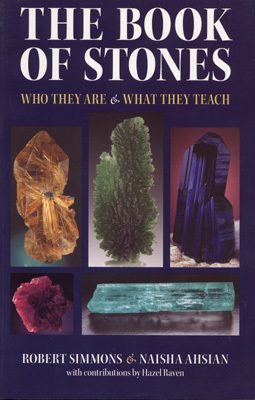 The Book of Stones is the most in-depth, definitive guide to the world of crystals, minerals, gemstones and their metaphysical energies that has yet been written. Encompassing over three hundred separate entries, each with vivid colour photographs and essays by both authors, this book takes you deep into the world of stones and their uses for spiritual awakening and self-healing. The Book of Stones can teach you about each mineral’s scientific properties, history and lore, elemental energies, chakra correspondences, and which stones work best together. Also considered are the stones’ effects on the spiritual, emotional and physical self. Whether you are a beginner or an experienced practitioner, The Book of Stones can give you clear, easy-to-understand information that will help you enjoy the beauty and benefits of the mineral realm. This pictorial metaphysical encyclopedia is what crystal lovers all over the world have been waiting for! The New Revised Edition, with New Stones, New Information on Moldavite and Azeztulite, a New Preface by Robert Sardello, and a NEW INDEX of Physical, Emotional and Spiritual Correspondences. Now it’s easier than ever to use the World’s Most Extensive, In-Depth and Complete Pictorial Reference Guide to the World of Minerals and Stones! It NOW has 465 pages (32 more) of spiritual, healing and scientific information on over 320 different stones (some new stones too) and it contains over 450 vivid colour pictures.